I have a bar chart that also includes a secondary Area Series (see pic). The Bar Series tracks daily count of safety conversations our employees do. 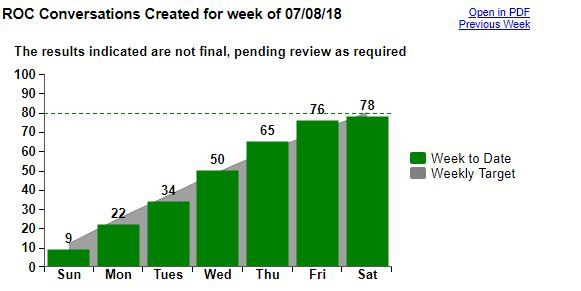 We are required to do at least 80 over the course of a week. Basically, if we do 12 per day, we would be safe to reach our goal. What I would like to do, is to have the Area Series change from grey to yellow in color if we fall below the average at any time. So, if we're below 12 on Monday, yellow, if we're at 25 on Tuesday, grey, and so on. Any time the count gets to 80 or above, it would go to grey regardless of the day. Any thoughts on how to script this? One other requirement my manager would like to see is that if the count is less than 72 any time on Friday, the bar would be a bright yellow (the Area Series can be a 'dirty' yellow for the above question), and the bar should be red if the count is below 80 at any time on Saturday. Here's an example (see attached). This chart area changes to yellow if behind during the week and orange if behind on Friday. I forgot to add code for Saturday, but it's the same idea.